In a previous post I introduced the luscious Yale & Towne hardware of the Cross House, my response to an inquiry by Bo Sullivan. While I have always been aware that the house was blessed with luscious hardware, until doing the post I did not quite realize just how luscious fabulous delicious the hardware was. The first floor of the house has a bathroom. I think, think, it was originally a powder room (sink/toilet), and was converted into a full bath (sink/toilet/tub) during the 1929 conversion of the house into apartments. While restoring the bathroom, I removed its door last year, and it has been leaning again a wall ever since. 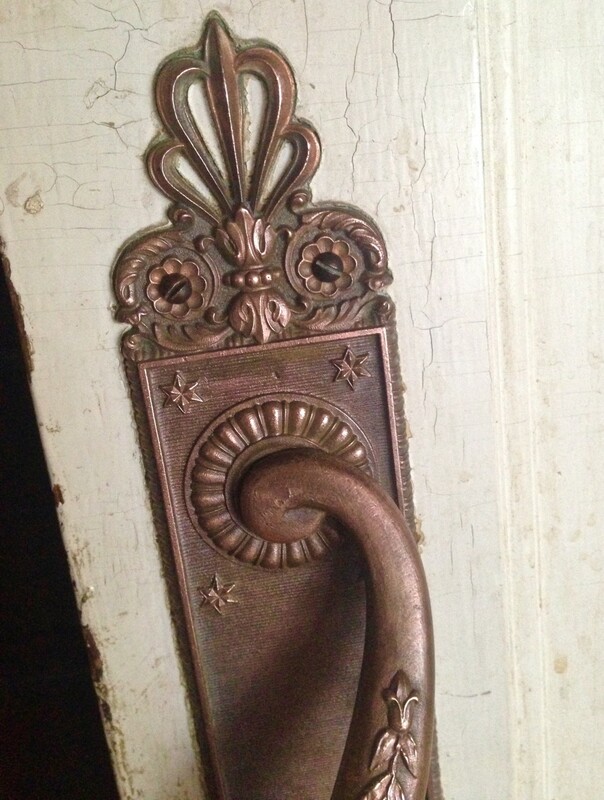 The door has always been an item of curiosity, for instead of having a standard door knob set, it had a pull handle and HUGE odd hinges. Until today I gave these oddities not much thought (for, there were 6, 768 other things about the house demanding attention). Today though, I have answers to these oddities. The side of the door facing into the bathroom has a pull handle, and a lock under. I have never before seen a pull handle in a bathroom. I assumed it was not original. 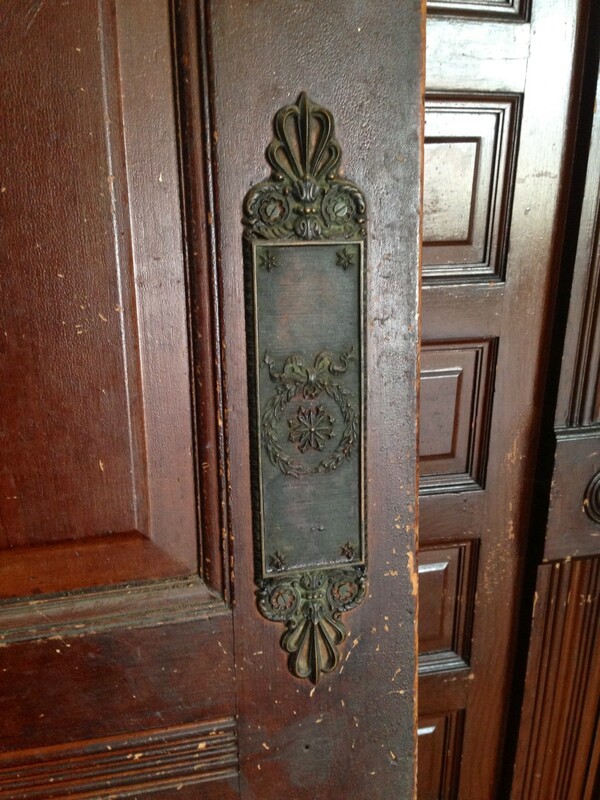 The side of the door facing the hall has a push plate. Upside-down! I removed the pull handle, fully expecting to find evidence that it was not originally in this location. But I was wrong! Under the pull was, I think, the original finish. 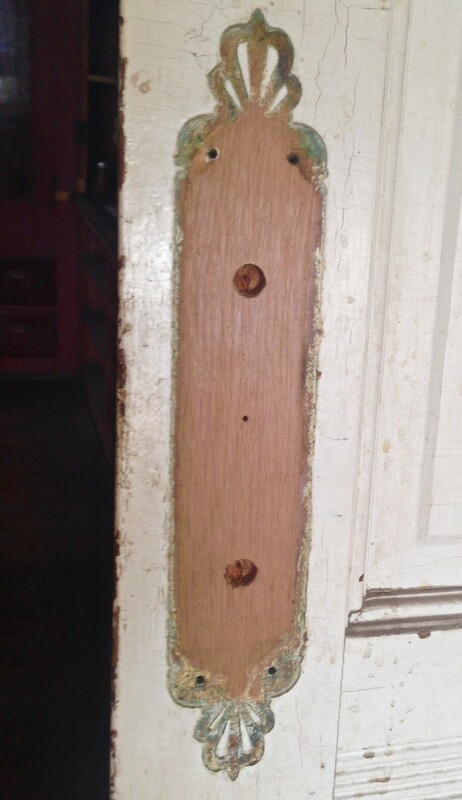 It looks like bare wood but the pale color matches the color of the parlor trim. 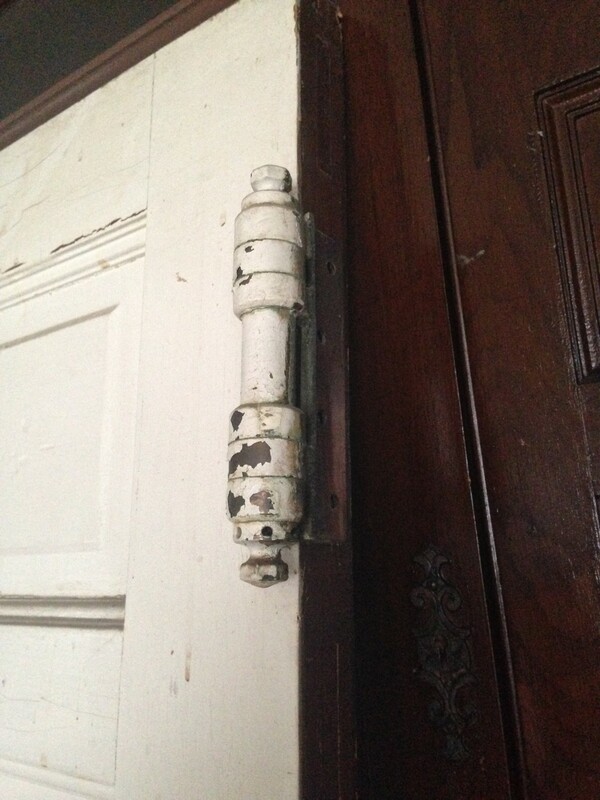 And there cannot be any question that the pull handle was always attached the bathroom door. 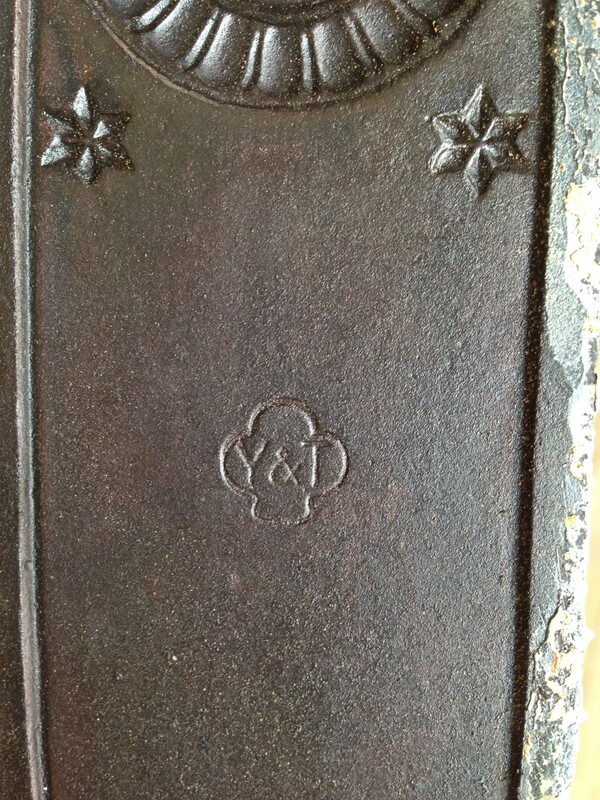 Turning the pull handle around revealed the Yale and Towne stamp. Cool. Another odd thing about The Door is its hinges. What are these crazy BIG hinges doing on a bathroom door????????? I pondered all this weirdness. And pondered a bit more. It all made no sense, but as it all seemed original it MUST have made sense in 1894, right? Then it hit me. And the over-the-top hinges provided the answer. The hinges are self-closing. Yep, self-closing. This means that the bathroom door would ALWAYS remain closed. Thus, anybody walking down the hall to the family entrance door would not be assaulted with the visual indelicacy of a visible toilet. Oh, the horror. The horror! In short, all the weirdness was to protect delicate Victorian-era sensibilities. Because the door was self-closing, it did not need a normal knob set. Instead, it had a PUSH PLATE on the outside, and a PULL HANDLE on the inside. And a lock. And what had always seemed odd and not likely original now seems really interesting and certainly original. I appreciate that all this is just about a single friggin’ door, but I am nonetheless fascinated. Oh, and speaking of delicate sensibilities. AFTER! Although I installed it upside-down! Well, an easy fix! 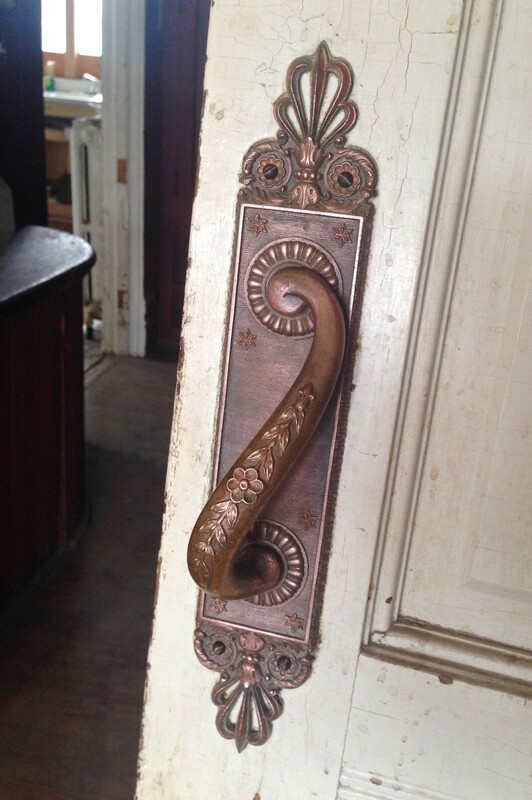 Also, while it will take me awhile to remove the paint from the door, for now at least honor has been returned to the Yale & Towne pull handle. Whew. Whew! Ooh, surely Downton Abbey didn’t have anything so grand! And speaking of the Ladies and Gents room, have you noticed that peacocks are sort of anthemion, with their tail feathers spread? You are right! There is a sorta kinda somewhat anthemion aspect to peacock feathers! So, the peacock wallpaper I plan to use for the powder room is ever more perfect!!!!!! Did you dare to strip the hinges as well? I have identical hinges on my butler’s pantry door needing to be stripped but chickened out after being told that the springs would have to be reset when they were reinstalled. I have no idea if this is true or what it would entail, but the hinges are still installed, half stripped, mocking me…. I love your bathroom door rational, I never would have figured it out! 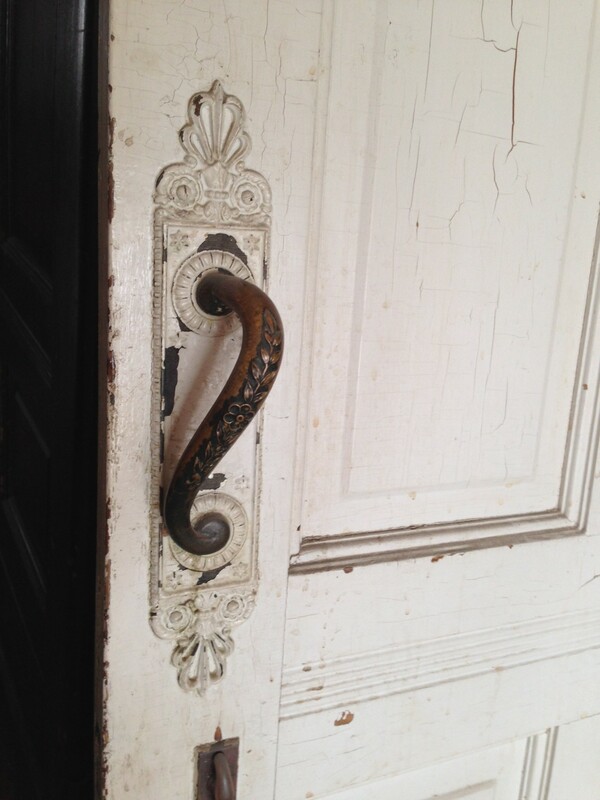 Love those door handles. they are spectacular. omg omg !!!! Shouldn’t it be the other way around: if the hinges are to auto close the door, then you would need a pull handle on the outside to get into the bathroom and just a push plate on the inside to get out.